​ ​ Do you know Ola Beach Club is the only Hawaiian themed in Singapore? Do you know only Ola has heart pumping water sports such as Jet Pack and Jetblade at Sentosa? Ola, which means “life” in Hawaiian , has made it an ideal urban escape from the hectic city life. You would know what I mean when you pay a visit to this lovely place! Well, a good chilling place comes with good food! Here in Ola, you get to try cold and hot starters and complement them with some cocktails! Lomi Lomi Salmon [$16] Mini Waffle cups that filled with flaked Norwegian Salmon and tossed with tomatoes, sweet maui onions , a spritz of lemon and topped with flying fish roe. A perfect bite sized dish along the beach. Saimin Salad [$15] Oooh i love this dish! Cold somen noodles served with spam, omelettes,crispy fish cake and lettuce! Topped up $5 for pan seared scallops/ $7 for lomi lomi salmon/ $7 for Ahi Poke! The fish cakes are pretty good! Ahi Poke[$20] Left:Kimchi , Right: Shoyu Go for a healthier option if you need! Shoyu is the lighter version and Kimchi is the spicy version. Needless to say, I opt for Kimchi one! Kalua Pig Taco [$25] Yes, this dish is a crowd pleaser at Ola!The Kuala Pork was steamed and baked for 3 hrs till the meat becomes tender so that it can be shredded effortlessly. Then, they filled kuala pork, house made Roma tomato relish, guacamole, lettuce, gooey melted cheddar cheese with tacos. Guys! Try it! Grilled Octopus[$18.50] Do not underestimate this dish by its simple appearance as this dish is pretty addictive!Squids were grilled over an open fire in a special netted basket that rendered a soft and poached-like texture. Loco Moco[$28] Medium rare wagyu beef patty and layered over japanese steamed rice , topped with a panko crusted egg. Add $6 for pan seared Foie Gras! Huli Huli Chicken [$26] Teriyaki Marinated chicken! Served with Burnt Leeks, vegetable puree and natural jus! Haupia Sphere[$22]-Must Try! 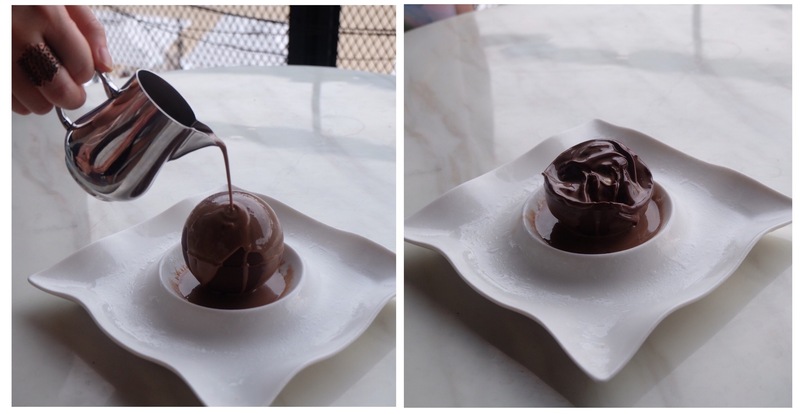 Reveal the sweet hidden treasures in this Valrhona dark chocolate sphere by pouring the warm chocolate sauce! What is in this sphere? Coconut Chantilly cream, desiccated coconut sponge cake, Nata de coco and Vanilla ice cream!! I love it!